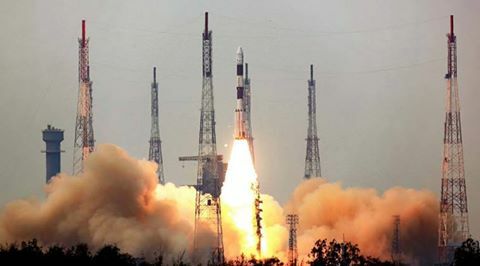 New Delhi: In its thirty seventh flight (PSLV-C35), ISRO’s Polar Satellite Launch Vehicle successfully launched the 371 kg SCATSAT-1 Satellite along with seven co-passenger satellites today morning (September 26, 2016) from Satish Dhawan Space Centre SHAR, Sriharikota. This is the thirty sixth consecutively successful mission of PSLV. The total weight of all the eight satellites carried on-board PSLV-C35 was 675 kg. PSLV-C35 is the first PSLV mission to launch satellites carried onboard into two different orbits. This PSLV mission was the longest of the PSLV missions conducted till date and was completed in 2 hours 15 minutes and 33 seconds after lift-off. After separation, the two solar arrays of SCATSAT-1 satellite were deployed automatically and ISRO’s Telemetry, Tracking and Command Network (ISTRAC) at Bangalore took over the control of the satellite. In the coming days, the satellite will be brought to its final operational configuration following which it will begin to provide weather related services using its scatterometer payload. The data sent by SCATSAT-1 satellite will help provide weather forecasting services to user communities through the generation of wind vector products as well as cyclone detection and tracking. 37 seconds later, the Dual Launch Adapter was successfully separated from the PSLV-C35 fourth stage. 30 seconds after this event, ALSAT-1 was the first co-passenger satellite to be separated successfully. Following this, the NLS-19, PRATHAM, PISAT, ALSAT-1B, ALSAT-2B, and Pathfinder-1 were separated from the PSLV fourth stage in a predetermined sequence thereby successfully completing PSLV-C35 mission.